KEF marks 50th anniversary with LS50 mini monitor | What Hi-Fi? KEF is marking its 50th anniversary year with the release of a special edition LS50 mini monitor speaker derived from the legendary LS3/5a used by the BBC in the 1960s. Designed to bring the "professional studio monitor concept into the home", the KEF LS50 Anniversary will sell for £800 a pair. 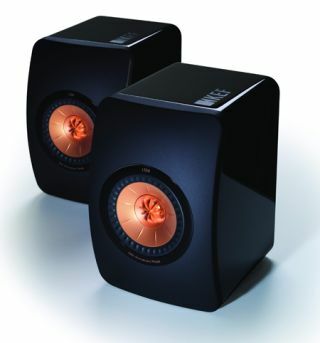 They incorporate technology from KEF's flagship Blade speaker and use a KEF Uni-Q drive array. The cabinet features constrained layer damping to reduce resonances, while the baffe shape has been optimised for smooth on- and off-axis dispersion. And the Uni-Q driver uses a damped Mg/Al alloy metal low/mid frequency cone and a rear-vented high frequency unit. KEF says its R&D team was given a free hand to build the best small enclosure it could, regardless of the usual industrial design constraints. The KEF LS50 Anniversary model is finished in gloss black with a rose gold Uni-Q driver. It's available now. • As part of its 50th anniversary celebrations, KEF is also offering a free £50 voucher to anyone signing up for the company's weekly KEFTalk newsletter. The free voucher can be used against the purchase of any product over £300 on the firm's online KEFStore.